1. Build my Japanese type collection. I started the year at 35%, with a goal of 50%. I currently sit at 56% of known sets. I'd say that's a success! 2. Put together/buy some 2013 sets. This isn't too hard, really. I bought flagship Topps, Gypsy Queen, and Allen & Ginter base sets, as I hoped to do. I also picked up base sets for Panini's Cooperstown and Golden Age sets and Upper Deck's Goodwin Champions. There are a few insert sets tossed in as well. I am not sure yet if I have a full Dealing Aces insert set from Gypsy Queen, though I think I was successful and thus my mini-master set of Gypsy Queen is done too! I haven't been able to do anything with Triple Play but I still call that another success! 3. Finish 10 sets from years past. I had six sets completed halfway through the year, but my US card collection stayed stagnant through the fall. But some Black Friday purchases on COMC.com got me beyond my goal and put me closer for several other old sets. That's three successes in a row! 4. Pay more attention to Panini. As I mentioned in my second goal, I purchased a couple Panini sets this year and plan on tackling Triple Play at some point. I actually bought less Panini product this year but I have more on my want list - I would like to put together a mini-master set of Golden Age. Unless something really special happens in the next couple of days, though, without Triple Play I'd say this is a fail. 5. 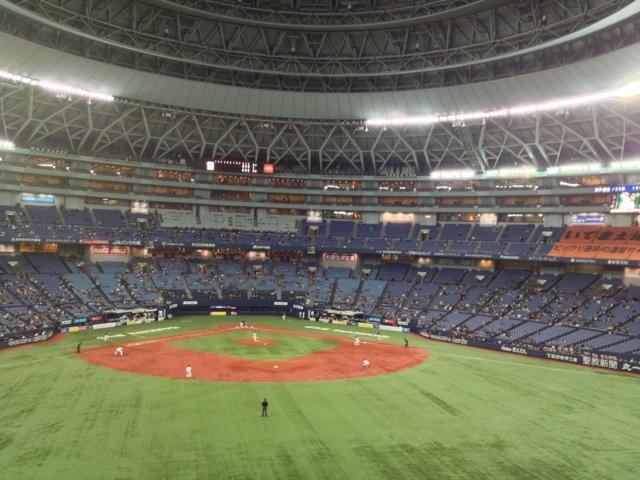 Visit the rest of the NPB baseball stadiums. I went to five stadiums in 2012, leaving seven remaining for 2013. With careful planning I managed to get to games in all seven home stadiums, and see women's professional games at two other stadiums in Japan. Success! 6. "Fix" my MLB type collection. My spreadsheets were full of cards from non-MLB issues - especially minor league team sets. As I said at the beginning of the year, I am interested in adding type cards from those issues into my collection, but the spreadsheets were massive and misleading. While I've been away from the blog, I haven't been away from the keyboard: I spent my evenings for a week or so pulling out minor league team sets. The minor league pack-based issues are still included. This is a success! I don't recall exactly how many packages I mailed about a month ago but with the trades I did earlier in the year I think I reached 15. Minor success. 8. Finish at least two player collections. Despite being quite easy, I didn't bother with my player collections for most of the year. I added a few cards to a couple players, and I could "cheat" by jumping on COMC and grabbing a few to complete a couple younger players, but I'm going to be honest and say this is a fail. 9. Post a year-by-year review of Calbee issues. I started this, but I haven't had much time for posting over the past couple of months, after turning out a couple posts. I didn't abandon this goal, but I wasn't able to complete it: fail. 10. Do a better job picking up 2013 release singles. 2011: 22%. 2012: 13%. 2013: 7.5%. There is a package coming from the States with some more trades included and the number should rise, but I won't come anywhere near my 25% goal. Due to trading conversations I didn't really buy any cards from 2013, so I have to thank my friends for getting me to where I am. And I have worked on other parts of my type collection, with cards from the mid-90s and early 80s on the way. Fail, but not a big disappointment. 11. Make meaningful posts on the blog. I made less posts this year (92, compared to 122 last year) but I think this year's content is a bit better. I cut back on the pure "look at this" posts and brought more information on stores and new releases. Success. 12. Create a menu/table of contents for some of my posts. I started this and one page sits as a draft. I am waiting to publish it until I have more material in the books. I still want to make featured set and Japan's card shop indexes. But nothing's live on the blog, so this is a fail. Ending 2012 with disappointment in Korea left a bit of a bad taste in my mouth. But I've discovered plenty of new card shops and picked up hundreds of cards. NPB Card Guy visited Japan in February and I found new stores with him. Searching through boxes and binders for cards to add to my collections has provided hours of enjoyment over the past twelve months. Definitely a success. Well, eight successes, five fails. Not a bad year, and the ones that are really important to me were all successes. Have a happy New Year, everyone, and see you then!